Trade in those furry dice, sit back and get ready to make some crazy money. From the vertical streets of the West Coast to the frantic mayhem of the Small Apple and the zany nightlife of Glitter Oasis, you'd better get ready to throw the highway code out of the window - 'cos this is driving Crazy Taxi 3 style. -Drive through day or night including the new location of Glitter Oasis, a wild Las Vegas style city. -Choose from 12 crazy drivers and their cabs, including 4 all-new cabbies. 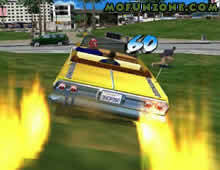 -Impress your customers with Crazy Drifting and Crazy Jumping for that extra tip. -Play from a range of Wild 'n' Crazy mini-games. Barangkali ada minat di bisnis kecil kecilan gan..